"Schliemann" redirects here. For other uses, see Schliemann (disambiguation). Heinrich Schliemann (German: [ˈʃliːman]; 6 January 1822 – 26 December 1890) was a German businessman and a pioneer in the field of archaeology. He was an advocate of the historicity of places mentioned in the works of Homer and an archaeological excavator of Hisarlik, now presumed to be the site of Troy, along with the Mycenaean sites Mycenae and Tiryns. His work lent weight to the idea that Homer's Iliad reflects historical events. Schliemann's excavation of nine levels of archaeological remains with dynamite has been criticized as destructive of significant historical artifacts, including the level that is believed to be the historical Troy. Along with Arthur Evans, Schliemann was a pioneer in the study of Aegean civilization in the Bronze Age. The two men knew of each other, Evans having visited Schliemann's sites. Schliemann had planned to excavate at Knossos but died before fulfilling that dream. Evans bought the site and stepped in to take charge of the project, which was then still in its infancy. Schliemann was born in Neubukow, Mecklenburg-Schwerin (part of the German Confederation), in 1822. His father, Ernst Schliemann, was a Lutheran minister. The family moved to Ankershagen in 1823 (today their home houses the Heinrich Schliemann Museum). Heinrich's father was a poor Pastor. His mother, Luise Therese Sophie Schliemann, died in 1831, when Heinrich was nine years old. After his mother's death, his father sent Heinrich to live with his uncle. When he was eleven years old, his father paid for him to enroll in the Gymnasium (grammar school) at Neustrelitz. Heinrich's later interest in history was initially encouraged by his father, who had schooled him in the tales of the Iliad and the Odyssey and had given him a copy of Ludwig Jerrer's Illustrated History of the World for Christmas in 1829. Schliemann later claimed that at the age of 7 he had declared he would one day excavate the city of Troy. However, Heinrich had to transfer to the Realschule (vocational school) after his father was accused of embezzling church funds and had to leave that institution in 1836 when his father was no longer able to pay for it. His family's poverty made a university education impossible, so it was Schliemann's early academic experiences that influenced the course of his education as an adult. In his archaeological career, however, there was often a division between Schliemann and the educated professionals. At age 14, after leaving Realschule, Heinrich became an apprentice at Herr Holtz's grocery in Fürstenberg. He later told that his passion for Homer was born when he heard a drunkard reciting it at the grocer's. He laboured for five years, until he was forced to leave because he burst a blood vessel lifting a heavy barrel. In 1841, Schliemann moved to Hamburg and became a cabin boy on the Dorothea, a steamer bound for Venezuela. After twelve days at sea, the ship foundered in a gale. The survivors washed up on the shores of the Netherlands. Schliemann became a messenger, office attendant, and later, a bookkeeper in Amsterdam. On March 1, 1844, 22-year-old Schliemann took a position with B. H. Schröder & Co., an import/export firm. In 1846, the firm sent him as a General Agent to St. Petersburg. In time, Schliemann represented a number of companies. He learned Russian and Greek, employing a system that he used his entire life to learn languages; Schliemann claimed that it took him six weeks to learn a language and wrote his diary in the language of whatever country he happened to be in. By the end of his life, he could converse in English, French, Dutch, Spanish, Portuguese, Swedish, Polish, Italian, Greek, Latin, Russian, Arabic, and Turkish as well as German. Schliemann's ability with languages was an important part of his career as a businessman in the importing trade. In 1850, he learned of the death of his brother, Ludwig, who had become wealthy as a speculator in the California gold fields. Schliemann went to California in early 1851 and started a bank in Sacramento buying and reselling over a million dollars' worth of gold dust in just six months. When the local Rothschild agent complained about short-weight consignments he left California, pretending it was because of illness. While he was there, California became the 31st state in September 1850, and Schliemann acquired United States citizenship. While this story was propounded in Schliemann's autobiography of 1881, Christo Thanos and Wout Arentzen, state clearly that Schliemann was in St Petersburg that day, and "in actual fact, ...obtained his American citizenship only in 1869." According to his memoirs, before arriving in California he dined in Washington, D.C. with President Millard Fillmore and his family, but Eric Cline says that Schliemann didn't attend but simply read about it in the papers. Schliemann also published what he said was an eyewitness account of the San Francisco Fire of 1851, which he said was in June although it took place in May. At the time he was in Sacramento and used the report of the fire in the Sacramento Daily Journal to write his report. On April 7, 1852, he sold his business and returned to Russia. There he attempted to live the life of a gentleman, which brought him into contact with Ekaterina Lyschin, the niece of one of his wealthy friends. Schliemann had previously learned that his childhood sweetheart, Minna, had married. Heinrich and Ekaterina married on October 12, 1852. The marriage was troubled from the start. Schliemann next cornered the market in indigo dye and then went into the indigo business itself, turning a good profit. Ekaterina and Heinrich had a son, Sergey, and two daughters, Natalya and Nadezhda, born in 1855, 1858, and 1861, respectively. Schliemann made yet another quick fortune as a military contractor in the Crimean War, 1854–1856. He cornered the market in saltpeter, sulfur, and lead, constituents of ammunition, which he resold to the Russian government. By 1858, Schliemann was 36 years old and wealthy enough to retire. In his memoirs, he claimed that he wished to dedicate himself to the pursuit of Troy. As a consequence of his many travels, Schliemann was often separated from his wife and small children. He spent a month studying at the Sorbonne in 1866, while moving his assets from St. Petersburg to Paris to invest in real estate. He asked his wife to join him, but she refused. Schliemann threatened to divorce Ekaterina twice before doing so. In 1869, he bought property and settled in Indianapolis for about three months to take advantage of Indiana's liberal divorce laws, although he obtained the divorce by lying about his residency in the U.S. and his intention to remain in the state. He moved to Athens as soon as an Indiana court granted him the divorce and married again three months later. Schliemann's first interest of a classical nature seems to have been the location of Troy. At the time he began excavating in Turkey, the site commonly believed to be Troy was at Pınarbaşı, a hilltop at the south end of the Trojan Plain. The site had been previously excavated by archaeologist and local expert, Frank Calvert. Schliemann performed soundings at Pınarbaşı but was disappointed by his findings. It was Calvert who identified Hissarlik as Troy and suggested Schliemann dig there on land owned by Calvert's family. In 1868, Schliemann visited sites in the Greek world, published Ithaka, der Peloponnesus und Troja in which he asserted that Hissarlik was the site of Troy, and submitted a dissertation in Ancient Greek proposing the same thesis to the University of Rostock. In 1869, he was awarded a PhD in absentia from the university of Rostock for that submission. David Traill wrote that the examiners gave him his PhD on the basis of his topographical analyses of Ithaca, which were in part simply translations of another author's work or drawn from poetic descriptions by the same author. Schliemann was at first skeptical about the identification of Hissarlik with Troy but was persuaded by Calvert and took over Calvert's excavations on the eastern half of the Hissarlik site. The Turkish government owned the western half. Calvert became Schliemann's collaborator and partner. Schliemann needed an assistant who was knowledgeable in matters pertaining to Greek culture. As he had divorced Ekaterina in 1869, he advertised for a wife in a newspaper in Athens. A friend, the Archbishop of Athens, suggested a relative of his, 17-year-old Sophia Engastromenos (1852–1932). Schliemann, age 47, married her in October 1869, despite the 30 year difference in age. They later had three children, Andromache, Troy, and Agamemnon Schliemann; he reluctantly allowed them to be baptized, but solemnized the ceremony in his own way by placing a copy of the Iliad on the children's heads and reciting 100 hexameters. Schliemann began work on Troy in 1871. His excavations began before archaeology had developed as a professional field. Thinking that Homeric Troy must be in the lowest level, Schliemann and his workers dug hastily through the upper levels, reaching fortifications that he took to be his target. In 1872, he and Calvert fell out over this method. Schliemann was angry when Calvert published an article stating that the Trojan War period was missing from the site's archaeological record. Schliemann was elected a member of the American Antiquarian Society in 1880. A cache of gold and other objects appeared on or around May 27, 1873; Schliemann named it "Priam's Treasure". He later wrote that he had seen the gold glinting in the dirt and dismissed the workmen so that he and Sophia could excavate it themselves; they removed it in her shawl. However, Schliemann's oft-repeated story of the treasure's being carried by Sophia in her shawl was untrue. 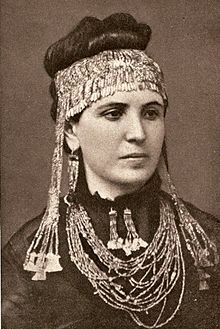 Schliemann later admitted fabricating it; at the time of the discovery Sophia was in fact with her family in Athens, following the death of her father. Sophia later wore "the Jewels of Helen" for the public. Those jewels, taken from the Pergamon Museum in Berlin by the Soviet Army (Red Army) in 1945, are now in the Pushkin Museum in Moscow. Schliemann published his findings in 1874, in Trojanische Altertümer ("Trojan Antiquities"). This publicity backfired when the Turkish government revoked Schliemann's permission to dig and sued him for a share of the gold. Collaborating with Calvert, Schliemann smuggled the treasure out of Turkey. He defended his "smuggling" in Turkey as an attempt to protect the items from corrupt local officials. Priam's Treasure today remains a subject of international dispute. Schliemann published Troja und seine Ruinen (Troy and Its Ruins) in 1875 and began excavation of the Treasury of Minyas at Orchomenus (Boeotia) in 1880. In 1876, he began digging at Mycenae. Upon discovering the Shaft Graves, with their skeletons and more regal gold (including the so-called Mask of Agamemnon), Schliemann cabled the king of Greece. The results were published in Mykenai in 1878. Although he had received permission in 1876 to continue excavation, Schliemann did not reopen the dig site at Troy until 1878–1879, after another excavation in Ithaca designed to locate a site mentioned in the Odyssey. This was his second excavation at Troy. Emile Burnouf and Rudolf Virchow joined him there in 1879. Schliemann made a third excavation at Troy in 1882–1883, an excavation of Tiryns with Wilhelm Dörpfeld in 1884, and a fourth excavation at Troy, also with Dörpfeld (who emphasized the importance of strata), in 1888–1890. On August 1, 1890, Schliemann returned reluctantly to Athens, and in November travelled to Halle, where his chronic ear infection was operated upon, on November 13. The doctors deemed the operation a success, but his inner ear became painfully inflamed. Ignoring his doctors' advice, he left the hospital and travelled to Leipzig, Berlin, and Paris. From the latter, he planned to return to Athens in time for Christmas, but his ear condition became even worse. Too sick to make the boat ride from Naples to Greece, Schliemann remained in Naples but managed to make a journey to the ruins of Pompeii. On Christmas Day 1890, he collapsed into a coma; he died in a Naples hotel room the following day; the cause of death was cholesteatoma. His corpse was then transported by friends to the First Cemetery in Athens. It was interred in a mausoleum shaped like a temple erected in ancient Greek style, designed by Ernst Ziller in the form of a pedimental sculpture. The frieze circling the outside of the mausoleum shows Schliemann conducting the excavations at Mycenae and other sites. Schliemann's magnificent residence in the city centre of Athens, the Iliou Melathron (Ιλίου Μέλαθρον, "Palace of Ilium") houses today the Numismatic Museum of Athens. Further excavation of the Troy site by others indicated that the level he named the Troy of the Iliad was inaccurate, although they retain the names given by Schliemann. In an article for The Classical World, D.F. Easton wrote that Schliemann "was not very good at separating fact from interpretation" and claimed that, "Even in 1872 Frank Calvert could see from the pottery that Troy II had to be hundreds of years too early to be the Troy of the Trojan War, a point finally proven by the discovery of Mycenaean pottery in Troy VI in 1890." "King Priam's Treasure" was found in the Troy II level, that of the Early Bronze Age, long before Priam's city of Troy VI or Troy VIIa in the prosperous and elaborate Mycenaean Age. Moreover, the finds were unique. The elaborate gold artifacts do not appear to belong to the Early Bronze Age. His excavations were condemned by later archaeologists as having destroyed the main layers of the real Troy. Kenneth W. Harl, in the Teaching Company's Great Ancient Civilizations of Asia Minor lecture series, sarcastically claimed that Schliemann's excavations were carried out with such rough methods that he did to Troy what the Greeks could not do in their times, destroying and levelling down the entire city walls to the ground. In 1972, Professor William Calder of the University of Colorado, speaking at a commemoration of Schliemann's birthday, claimed that he had uncovered several possible problems in Schliemann's work. Other investigators followed, such as Professor David Traill of the University of California. In northwestern Turkey, Heinrich Schliemann excavated the site believed to be Troy in 1870. Schliemann was a German adventurer and con man who took sole credit for the discovery, even though he was digging at the site, called Hisarlik, at the behest of British archaeologist Frank Calvert. ... Eager to find the legendary treasures of Troy, Schliemann blasted his way down to the second city, where he found what he believed were the jewels that once belonged to Helen. As it turns out, the jewels were a thousand years older than the time described in Homer's epic. German archaeologist Heinrich Schliemann was the first to explore the Mound of Troy in the 1870s. Unfortunately, he had had no formal education in archaeology, and dug an enormous trench “which we still call the Schliemann Trench,” according to Rose, because in the process Schliemann “destroyed a phenomenal amount of material.” ... Only much later in his career would he accept the fact that the treasure had been found at a layer one thousand years removed from the battle between the Greeks and Trojans, and thus that it could not have been the treasure of King Priam. Schliemann may not have discovered the truth, but the publicity stunt worked, making Schliemann and the site famous and igniting the field of Homeric studies in the late 19th century. Schliemann's methods have been described as "savage and brutal. He plowed through layers of soil and everything in them without proper record keeping—no mapping of finds, few descriptions of discoveries." Carl Blegen forgave his recklessness, saying "Although there were some regrettable blunders, those criticisms are largely colored by a comparison with modern techniques of digging; but it is only fair to remember that before 1876 very few persons, if anyone, yet really knew how excavations should properly be conducted. There was no science of archaeological investigation, and there was probably no other digger who was better than Schliemann in actual field work." In 1874, Schliemann also initiated and sponsored the removal of medieval edifices from the Acropolis of Athens, including the great Frankish Tower. Despite considerable opposition, including from King George I of Greece, Schliemann saw the project through. The eminent historian of Frankish Greece William Miller later denounced this as "an act of vandalism unworthy of any people imbued with a sense of the continuity of history", and "pedantic barbarism". Peter Ackroyd's novel The Fall of Troy (2006) is based on Schliemann's excavation of Troy. Schliemann is portrayed as "Heinrich Obermann". Schliemann is also the subject of Chris Kuzneski's novel The Lost Throne. Schliemann is the subject of Irving Stone's novel The Greek Treasure (1975), which was the basis for the 2007 German television production Der geheimnisvolle Schatz von Troja (Hunt for Troy). Bericht über de Ausgrabungen in Troja im Jahre 1890 (1891) (reissued by Cambridge University Press, 2010. ISBN 978-1-108-01719-0). ^ a b Stefan Lovgren. "National Geographic News". National Geographic Society. Retrieved 2012-12-18. ^ Cornelia Maué, www.cornelia-maue.de. "website of schliemann-museum Ankershagen" (in German). Schliemann-museum.de. Archived from the original on 27 April 2018. ^ Schliemann, Heinrich (1881). Ilios: The City and Country of the Trojans: the Results of Researches and Discoveries on the Site of Troy and Through the Troad in the Years 1871-72-73-78-79; Including an Autobiography of the Author. Harper & Brothers. p. 3. ^ Cottrell, Leonard (1984). The Bull of Minos: The discoveries of Schliemann and Evans. Bell & Hyman Ltd. p. 36. ISBN 978-0-7135-2432-1. ^ Robert Payne, The Gold of Troy: The Story of Heinrich Schliemann and the Buried Cities of Ancient Greece, 1959, repr. New York: Dorset, 1990, p. 15. ^ a b c Allen, Susan Heuck (1999). Finding the walls of Troy: Frank Calvert and Heinrich Schliemann at Hisarlík. University of California Press. p. 112. ISBN 978-0-520-20868-1. ^ Leo Deuel, Memoirs of Heinrich Schliemann: A Documentary Portrait Drawn from his Autobiographical Writings, Letters, and Excavation Reports, New York: Harper, 1977, ISBN 0-06-011106-2, p. 67; he also mentions meeting President Andrew Johnson, p. 126. ^ "'So She Went': Heinrich Schliemann Came to Marion County for a "Copper Bottom Divorce"". 11 March 2015. ^ a b Easton, D.F. (May–June 1998). "Heinrich Schliemann: Hero or Fraud?". The Classical World. 91 (5): 335–343. doi:10.2307/4352102. JSTOR 4352102. ^ Bernard, Wolfgang. "Homer-Forschung zu Schliemanns Zeit und heute". Archived from the original on June 9, 2007. Retrieved 2008-09-24. CS1 maint: BOT: original-url status unknown (link) (in German). ^ Bryce, Trevor (2005). The Trojans and their neighbours. Taylor & Francis. p. 37. ISBN 978-0-415-34959-8. ^ "The scientific work". Archaeological Museum of Thebes. Retrieved 2017-11-23. ^ Kerns, Ann (2008-09-01). Troy. Twenty-First Century Books. ISBN 9780822575825. ^ Kenneth W. Harl. "Great Ancient Civilizations of Asia Minor". Retrieved November 23, 2012. ^ Lauren Stokes (2005-11-23). "Trojan wars and tourism: a lecture by C. Brian Rose". Swarthmore College Daily Gazette. Retrieved 2012-12-18. ^ Rubalcaba, Jill; Cline, Eric (2011). Digging for Troy. Charlesworth. pp. 30, 41. ISBN 978-1-58089-326-8. ^ Baelen 1959, pp. 242–243. ^ Miller 1908, p. 401. ^ Baelen 1959, p. 242. ^ Alexander, Tasha (2016). A Terrible Beauty. New York: Minotaur Books. pp. 91, 100–102, 145. ISBN 978-1-4104-9613-3. Baelen, Jean (1959). "L'Acropole pendant la guerre d'Indépendance [II. Le drame de la Tour Franque]". Bulletin de l'Association Guillaume Budé (in French). 1 (2): 240–298. doi:10.3406/bude.1959.3856. Boorstin, Daniel (1983). The Discoverers. Random House. ISBN 978-0-394-40229-1. Durant, Will (1939). The Life of Greece: Being a history of Greek civilization from the beginnings, and of civilization in the Near East from the death of Alexander, to the Roman conquest. Simon & Schuster. OCLC 355696346. Easton, D.F. (May–June 1998). "Heinrich Schliemann: Hero or Fraud?". The Classical World. 91 (5): 335–343. doi:10.2307/4352102. JSTOR 4352102. Poole, Lynn; Poole, Gray (1966). One Passion, Two Loves. Crowell. OCLC 284890. .
Silberman, Neil Asher (1990). Between Past and Present: Archaeology, Ideology, and Nationalism in the Modern Middle East. New York: Doubleday. ISBN 978-0-385-41610-8. Tolstikov, Vladimir; Treister, Mikhail (1996). The Gold of Troy. Searching for Homer's Fabled City. Harry N. Abrams. ISBN 978-0-8109-3394-1. Traill, David A. (1995). Schliemann of Troy: Treasure and Deceit. New York: St. Martin's Press. ISBN 978-0-312-14042-7. Wood, Michael (1987). In Search of the Trojan War. New American Library. ISBN 978-0-452-25960-7. Wikimedia Commons has media related to Heinrich Schliemann. American School of Classical Studies at Athens. Heinrich Schliemann and Family Papers at the Wayback Machine (archived October 5, 2007). Chisholm, Hugh, ed. (1911). "Schliemann, Heinrich" . Encyclopædia Britannica (11th ed.). Cambridge University Press. "Schliemann, Heinrich" . Encyclopedia Americana. 1920.